The Russian composer Grigory Frid (1915–2012), whose long life encompassed the entire existence of the Soviet Union, is best known for his 1969 chamber opera The Diary of Anne Frank. His sizeable output, which includes three symphonies, has yet to be properly explored. His chamber music includes three major works for viola and piano, their dignified restraint and emotional honesty taking the late works of Shostakovich as their stylistic starting point, going on to explore the soundworld of such composers as Schnittke, Denisov and Ligeti. 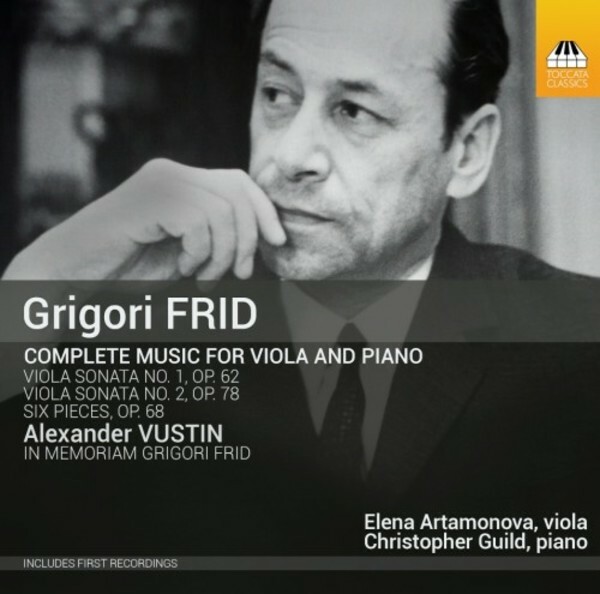 They are followed by In Memoriam Grigory Frid, a touching tribute by Alexander Vustin (b.1943) to his former teacher. Elena Artamonova was born in Moscow and studied at the Tchaikovsky Conservatoire with Yuri Bashmet: now based in the UK, she holds a number of international prizes and was awarded the Associateship of the Royal College of Music with Honours in 2000. Her previous recordings for Toccata Classics feature music by Vasilenko and Grechaninov. The Scottish pianist Christopher Guild has appeared as a Park Lane Group Young Artist in the Purcell Room of the South Bank Centre in London, and the Wigmore Hall, with the violinist Diana Galvydytė. Born in Elgin and brought up on Speyside, he entered the Royal College of Music in 2005 as a Foundation Scholar, and remained there under the tutelage of Andrew Ball until 2011, successfully gaining a First Class BMus (Hons), and the MMus and Artist Diploma’s with Distinction.